On an average, there are 1000s of visitors in a month on an online website. And if the website is a well-known e-commerce store then the number of visitors increases to 10000s. It is very difficult to engage these visitors and convert them to subscribers or as customers. Approximately, only 2% to 3% of the visitors are converted to the customers. There can be many reasons for this. As a visitor to any e-commerce store, when I visit the store to purchase a product I check some of the basic things like product price, product reviews, reviews given to the sellers who sell the products, the refund policy provided by the sellers and so on. After comparing all the aspects, I will purchase the product from the store which satisfies them. We will here discuss one of the factors from all of the above which is the product pricing. If you sell your products at a higher price and with high shipping costs, there is a high possibility that the visitors will not be converted to the customers. So to convert them into customers you can either reduce your product prices or you can provide customers with some discount coupons which they can use while purchasing. We will take an example here of an e-commerce store Amazon, which is widely used all over the world. 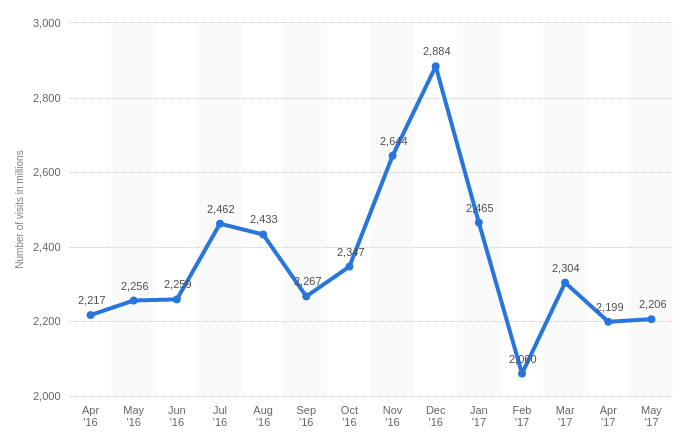 The statics says that there are approximately 2000 million combined desktop and mobile app visitors per month in a year’s time period from April 2016 to May 2017. The count of visitors is high but it is not necessary that all the visitors are the users who purchase the products from the store. There are some visitors who only explore new products on the website, some of them keep track of upcoming offers and deals on the website and so on. As we all know visits alone do not equate to a successful business. To make money, you’ve got to convert at least some of those visitors and turn them into customers. Thankfully, there’s plenty that you can do to get the ball rolling and start turning a popular website into a profitable website. One of the ways to turn your visitors into customers is to provide them something for free or at a discounted rate. So for example, if a user visits your website for the first time, you can provide them with free prime membership for one month or a discount of 10% or 20% for the first order. Visitors are generally attracted with this offers and take a step ahead to purchase the products. To make it more exciting and engaging for the visitors you can allow them to win this discount codes instead of providing them for free. 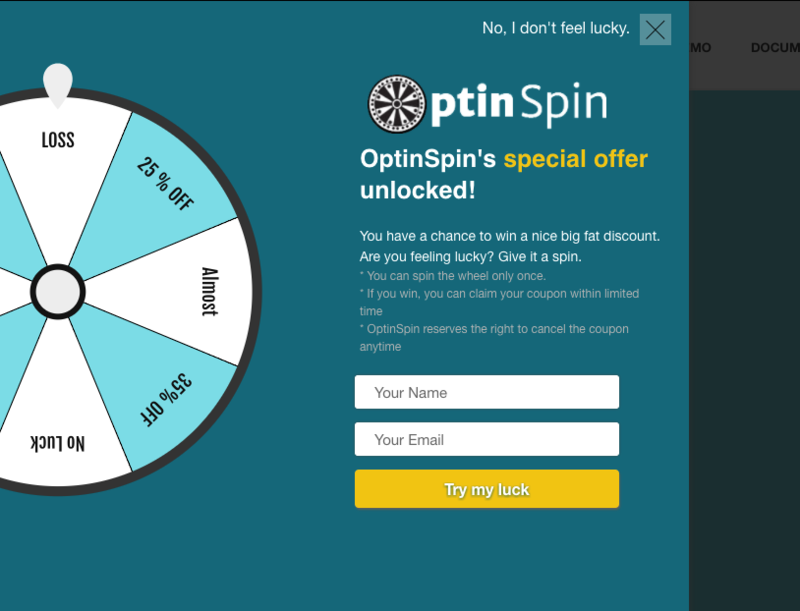 An example for such gaming option can be a spin wheel which will display all the available offers and the users will spin the wheel and win. 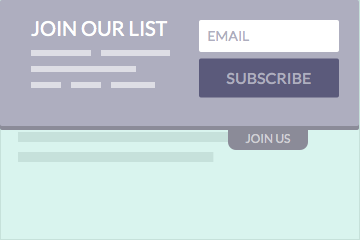 Here you can add an option to compulsorily input email address before spinning the wheel. This way you can also keep a track of the total visitors on your website and compare it with the users. It will give you a clear view of how many visitors are actually looking for the discounts and accordingly you can plan the pricing for your products. Pop-Ups – Pop-Ups are also known as light boxes, typically display in the centre of your website and are great at attracting attention from your visitors. Bars – Bars provide a full-width message that typically sits either on top of your site or at the bottom. 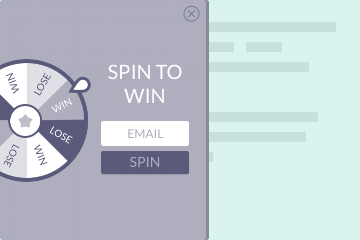 Spin to Win – Spin to Win is a new, highly engaging way to provide discount coupons. You can allow your customers to try their luck and win the prize on their own. 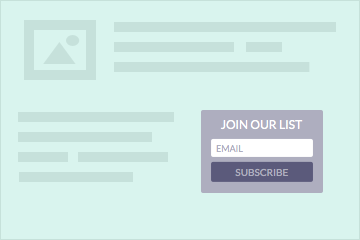 Flyouts – Flyouts appear in the bottom right or left of a screen and are a bit more subtle than a pop-up, but more likely to draw the attention than a banner or embed form because they include movement. Flyouts are particularly great for visitors who are in the middle of executing a task or reading a long-form page, like in the blog section of your site or on a product detail page. Banners – Banners provide a more subtle interaction that sits at the top or bottom of a site, but starts in a “hidden” state until triggered, then rolls into sight at the desired time. With attention-grabbing movement, a banner offers a less invasive choice than a pop-up but still includes movement that attracts the eye of your visitor. 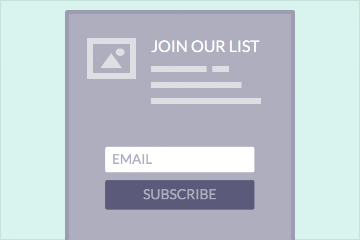 Embedded Forms – Embedded forms let you place a static sign-up form on your website to capture email addresses and other relevant information and are a great complimentary piece to your other campaigns and make for an excellent permanent installation in your footer or sidebar. Landing Pages – Landing pages function differently from Popups and other campaign types. The main difference is that it does not display on your site. Instead, a landing page is a self-contained campaign that you can direct your contacts to via a link. This is especially helpful in situations when you want to share a campaign across social media channels. 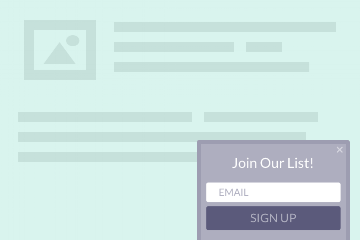 Designing your landing page can be done in a few easy steps. Tabs – Adding tabs to your campaign makes it easy for someone to access your display when it is not open by having a small, customizable, and always present call to action that opens the display. 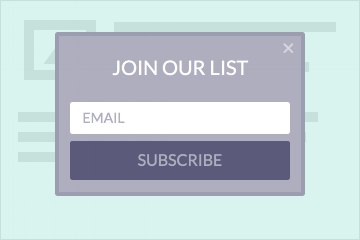 Thank you page – When someone fills out a form they will be shown a customizable thank you page to reveal coupon codes, links to gated content or more. This plugin was released on 13th October 2017, after we wrote this post. OptinSpin is built specifically for WooCommerce. It captures the visitor’s email address & generates a WooCommerce coupon for the discount that is won. As soon as the coupon is won, a bar appears at the bottom of the page with the coupon code & the time left for the coupon to expire. That encourages the user to finish the purchase. 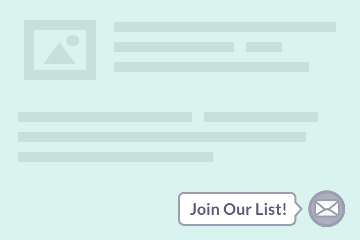 This is the first WordPress gamified list-building tool. 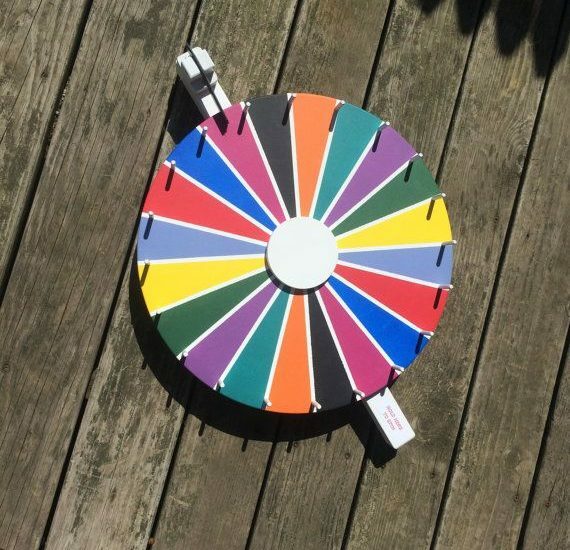 Capture your visitor’s email address while offering them a chance to win a prize by turning the wheel of fortune! It is fully integrated with WooCommerce. 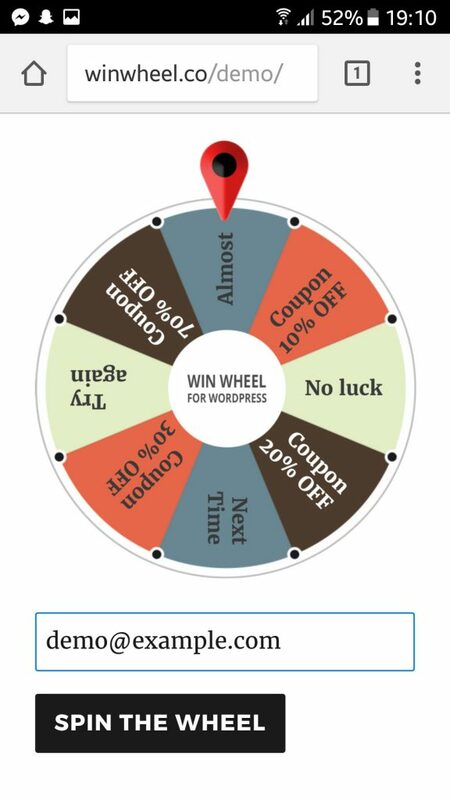 I found this plugin as one of the best for WordPress which provides an option to add a spin wheel. It provides complete control on when and where to show the pop-up. It has some predefined themes for the wheels which you can use. It also allows you to decide what to add in each of the slices. An overall experience was good and engaging. It provides you only 8 slices for the wheel. You can add your own content for the slices which you want to provide. It also has only one theme for the wheel unlike Wheel of Fortune plugin. It is a good plugin but with lesser flexibility. It allows you to create your own digital wheels for coupons, gifts, offers for individual products from WooCommerce plugin. 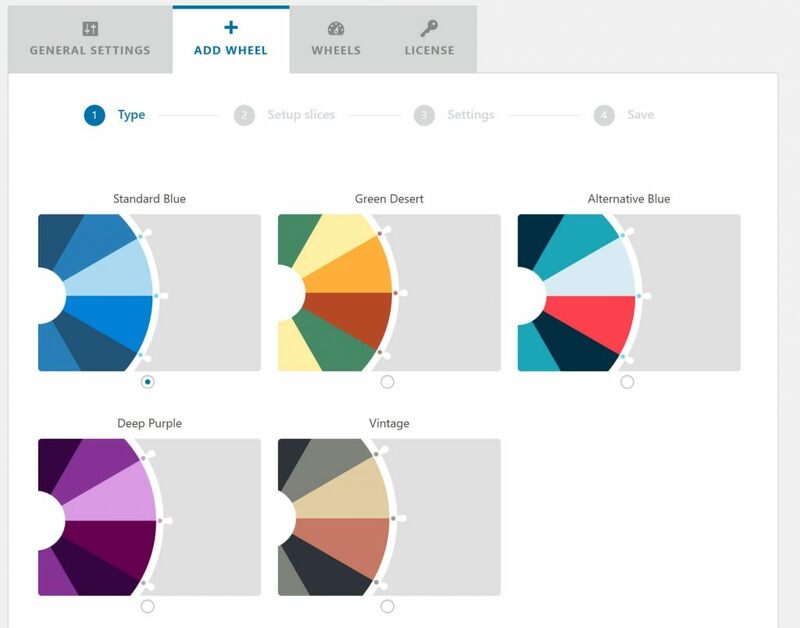 A Lucky Wheel tab is added with the settings on edit product page which allows you to setup wheel for the product. 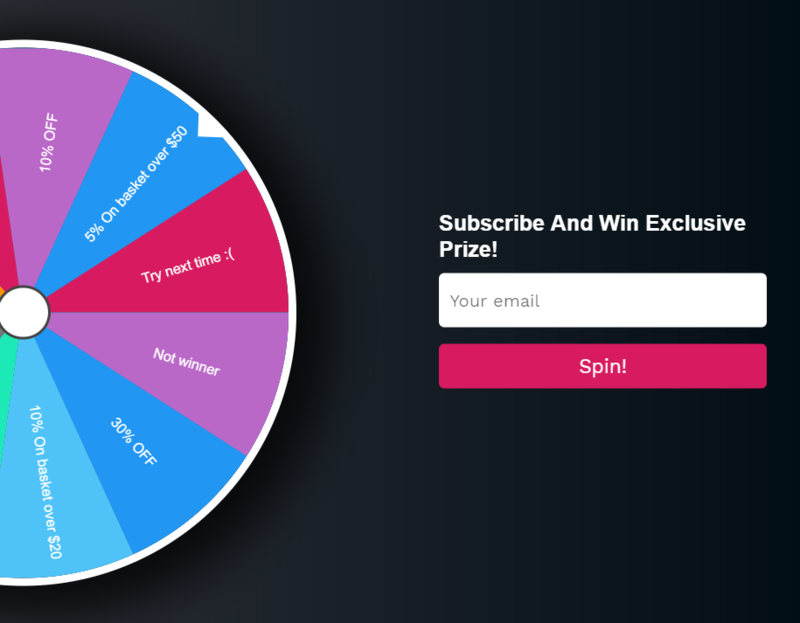 So, if you want to add a spin wheel for WooCommerce products, you can use this plugin. 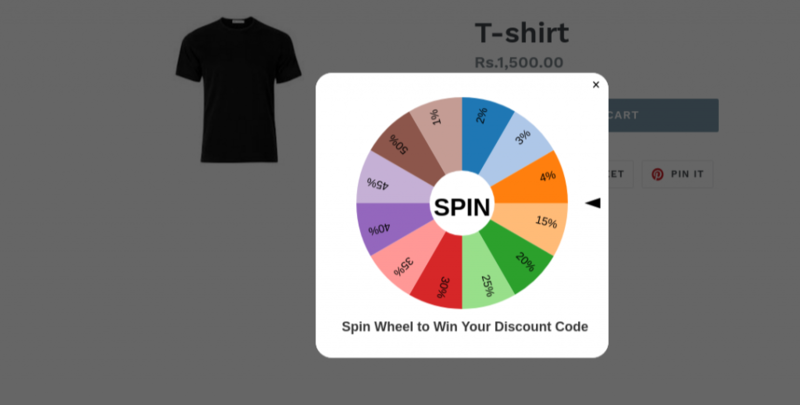 Discount Spinner is another WooCommerce plugin which allows you to add a spin wheel on the cart page. You can add any number of slices for the wheel. It also allows you to change the colours of the slices according to your theme. 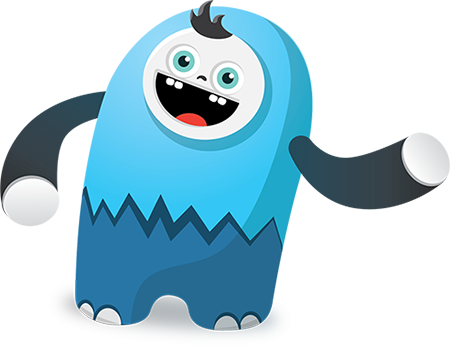 It is a WooCommerce plugin with more features and flexibility unlike Lucky Wheel For WooCommerce – Spin2Gift. Wheelio is a first gamified pop-up with exit intent, time trigger and tab trigger. It allows you to add Spin wheel on exit intent or on time intervals. 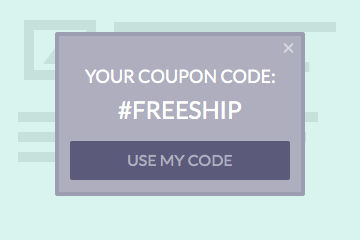 Visitors need to add their email address and then spin the wheel to get the coupon code for the purchase. It is one of the most engaging plugin from all the Shopify plugins. It is another Shopify app and one of the lowest pricing apps with the required number of features. It is somewhere similar to the Wheelio plugin in look. 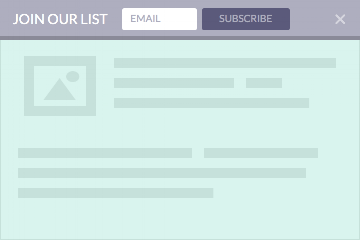 Privy helps you to capture more visitor emails. It helps you to improve on-site conversions and increase the online revenue. It is the highest pricing app among all the other apps. It is an interactive spinning wheel to attract your users and let them come back to your store again and again. 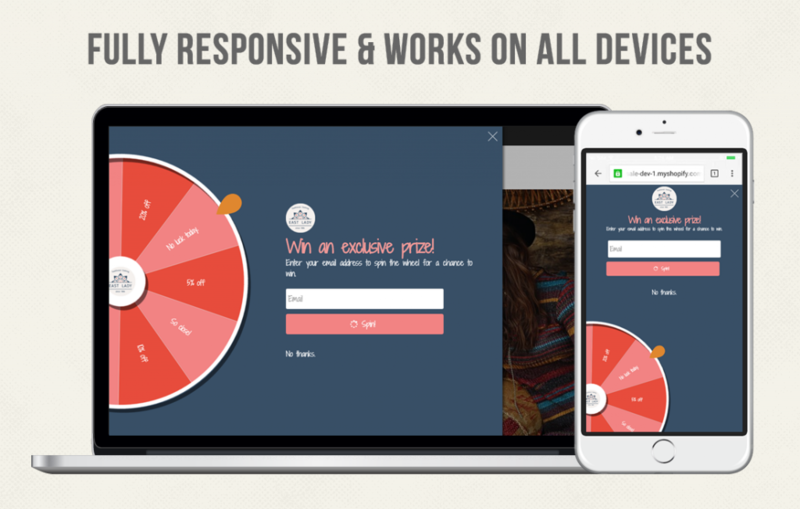 It gives your users a Dynamic range of Discount percentages and let them try their luck to win one discount code. It adds a pop-up on page load and once the wheel is spun, it allows visitors to log in to your social networking accounts or to subscribe with their email address. Discount Spinner app helps you to increase your data capture for future marketing, Increase your conversion rate and Increase your engagement rate. Gamification is not a new thing and it has been used by the best marketers for ages. The above-mentioned plugins simply connected it to a pop-up window and made the pop-up fun again. The perception of an annoying pop-up app is now forever changed. Apart from the admin settings, the front end of all the plugins is near to be same. All the plugins accept the visitor email address and allow them to win a discount in exchange. The main purpose of these plugins is to engage the visitors for a long time on the website with a fun pop-up and in return helps you to keep a track of all the visitors. What do you think, is this a better way to engage your visitors or are there any better options? We would like to know your thoughts. I’m glad that it helped you. 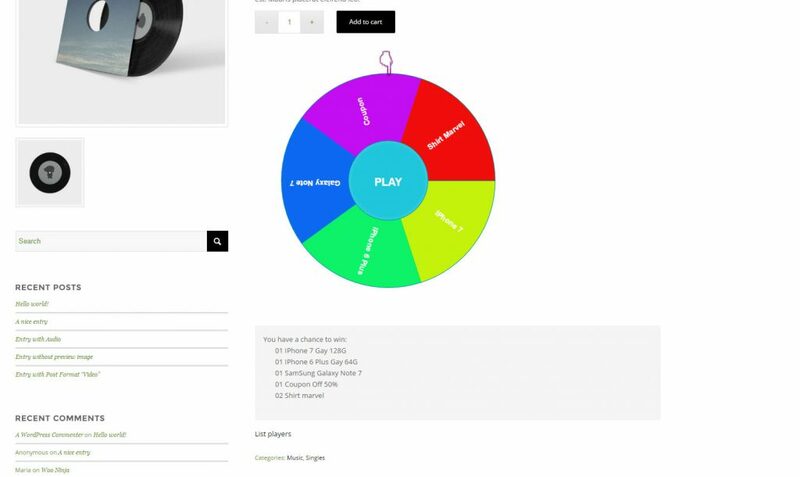 Yes, the Wheel of Fortune from Studio Wombat is very customizable and flexible. Thank you for the list!! It really is great. A thing i’d like to mentiont – try out privy, because they have a huge discount happening here – https://www.omnisend.com/ecommerce-shopify-app-bundle-spring so go get it, u will not be dissapointed.